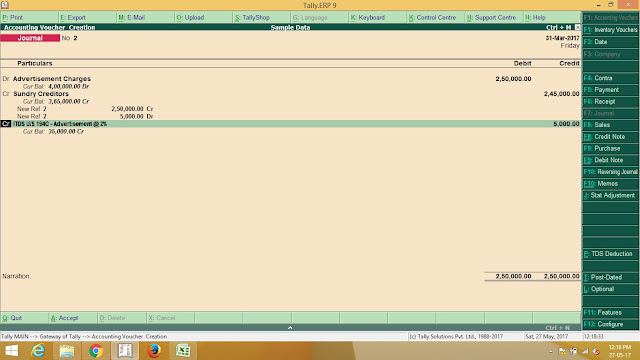 In earlier lessons, you know about how to configure and make a TDS deduction entry. 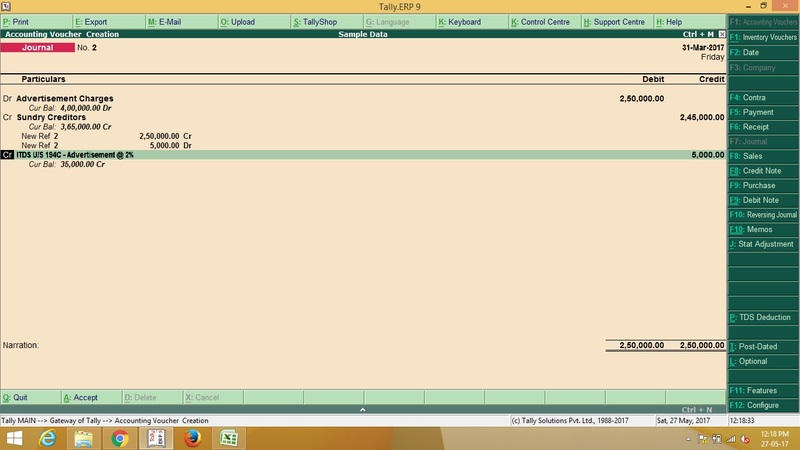 In this tutorial we teach you about how to make a statutory payment through auto fill option. This option provide you easy option to made payment Section Wise. For Example, If you deduct TDS on 194C for Rs. 30000 in a whole month then auto fill option choose you selected section for TDS payment entry. Auto fill option also allowed you to enter Challan No, Challan Date, Period, Bank & Other TDS Related information. 1. Create a Journal Voucher Entry. Above image show you that TDS deduct in the voucher automatically on Advertisement Charges @ 2%. Press Enter to Save the Entry. Now create a Payment Voucher, and Press ALT+S (for Statutory Payment), A list of Satutory dues will be appear on your screen which showing CST, Service Tax, TDS & VAT (as image shown below). CST for Central Sales Tax dues, Service Tax for Service Tax dues, VAT for Value Added Tax dues and TDS for Tax Deducted at Source Dues. 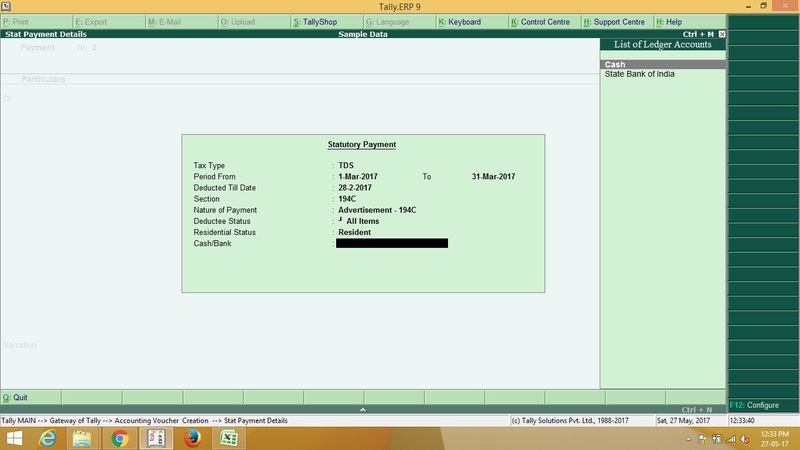 You need to select TDS, enter the period which you have to made the payment, Enter date till tds deducted (this is only for the period till date on which you have tds deducted), Select required Section, Select nature of payment, Select all items (if you want to make combine payment of Company and non company otherwise select Company for company deductee and non company for other than company deductee), select resident or non resident, select payment mode from which payment has to be made (whether it is bank or cash). Press Enter to save the entry. Now to to Display - Statutory Reports - TDS Reports - Challan Reconciliation, Press F5 there and enter the required details. Its done.